My recent analysis of the Yunusbayev et al. (2011) revealed an interesting anomaly: the Armenians_Y sample tested much more "European" than the existing Armenians_D and Armenians (from Behar et al. (2010)). A related "anomaly" was the use of some of my newer Dodecad tools that have been targeted to particular regions (e.g., Europe and West Asia for the newer euro7 calculator) by individuals from outside these regions (e.g., South Asia for euro7). Of course, I have cautioned against such use, but can we say something about why their use is not a very good idea. Suspecting a systematic effect, I decided to investigate. 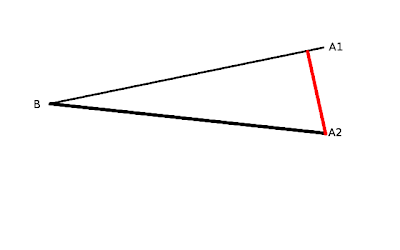 Suppose that a cline has been inferred from B to A1. 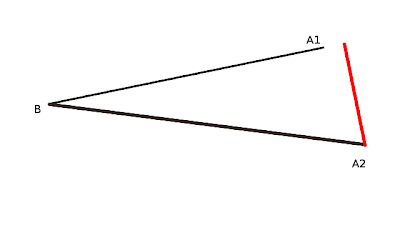 Suppose that dist(A1, B) = dist(A2, B). So, A1 and A2 differ from each other in an orthogonal direction relative to their difference from B. 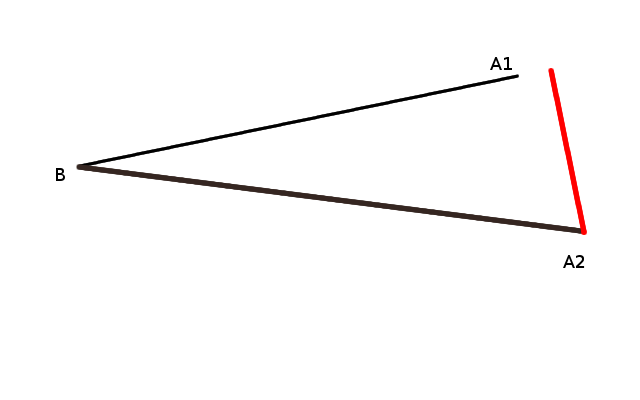 Now, if we project A2 onto the BA1 line, we see that A2 appears "intermediate" between them. The converse would occur if we project A1 onto the BA2 line. 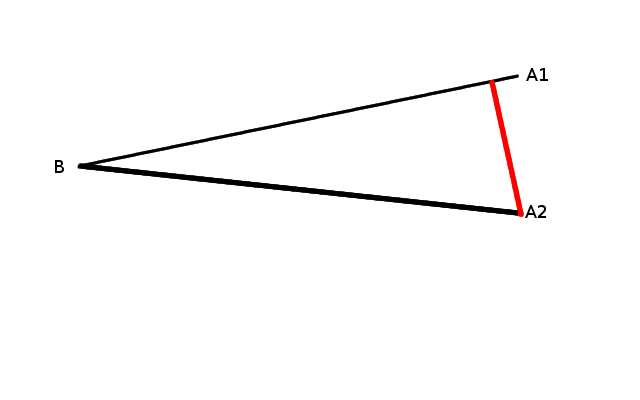 As you can see, now A2 (which is beyond the edge of the horizontal cline) cannot be projected between B and A1. In order to examine this intuition, I carried out a few simple tests. I set B to be HGDP North_Italians, A1 to be Behar et al. (2010) Armenians (with 3 outliers excluded), and A2 to be Yunusbayev et al. (2011) Armenians_Y. These results seem to confirm the geometric intuition. Now, I will add Assyrians_D, a population that seems closely related to Armenians, but appear to be a little more "eastern" in most analyses. So, it is "beyond" the North_Italian-Armenian cline. Again, the intuition is confirmed. A reasonable recommendation is to avoid mapping populations that are geographically outside the convex hull of the fixed populations. The position is most accurately determined when the edges of the cline are most securely "fastened". Use as many populations and individuals from the perimeter of the region under study as possible. There is no simple solution to the problem identified in this post. For short clines (e.g., within Europe) that are not securely fastened (few individuals from outlying groups), we can expect relatively large systematic errors. As an analogy, imagine trying to measure the height of a 5-year old on the wall with measuring tape and a book. If you don't keep the book steady, one of the endpoints of your measurement will be "wobbly". If you don't keep your measuring tape vertical, your measurement will be off. What can we do to solve this problem? Sample, sample, sample. There is no shortcut. The gross details of the genetic landscape (such as the relationship between major continental groups) are easy to infer, but the details will always have room for improvement. So, how should we interpret the high average total "European" component ("East European" + "West European") percentage of the Yunusbayev Armenians compared to those of the Dodecad and Behar Armenians? Your small tests show that the Yunusbayev Armenians are genetically more distant from European populations than the Dodecad and Behar Armenians are. Is it because of the high average "South Asian" component percentage of the Yunusbayev Armenians (4.3%) compared to those of the Dodecad and Behar Armenians (2.8% and 1.7% respectively)? This may explain why the Yunusbayev Armenians are genetically more distant from Europeans than the Dodecad and Behar Armenians are despite having higher average total "European" component percentage than the Dodecad and Behar Armenians have. So, how should we interpret the high average total "European" component ("East European" + "West European") percentage of the Yunusbayev Armenians compared to those of the Dodecad and Behar Armenians? With caution. Since these Armenians were sampled at a different location than the Behar et al. Armenians, they are likely to be different from them due to drift. In the next iteration of the Dodecad analysis, which will include the new Y. populations, their position vis a vis Europeans will be better defined. But, there will be more Eurasian-wide analyses that will incorporate the new Y. samples, as well as those from participants that have accumulated since the development of v3. Unfortunately, there is no South Asian population and consequently no "South Asian" component in euro7. This makes its Armenian results less reliable than they would be in the presence of a "South Asian" component. Yeah, that is a common result in the populations analyzed. Mait Metspalu (one of the lead authors of the Yunusbayev et al. and Behar et al. papers) has just told me via email that the Yunusbayev Armenian samples come from different parts of the Republic of Armenia. So the Yunusbayev Armenians are unlikely to have experienced genetic drift as whole; they must be much more representative of the overall Armenian genetic variation than the Behar Armenians (than even just the non-outlier ones of the Behar Armenians), as, in contrast to the Yunusbayev Armenians, the Behar Armenians all come from a single city (Maikop) in Russia (Mr. Metspalu previously told me that).